If you're searching for Angus's tone, this is the missing part of the jigsaw. For anyone else, it's a rather excellent tone-conditioning pedal that will enhance your sound and playing experience. A no-brainer for that Angus sound (it's good enough for him, after all), and no one-trick pony, either. It's not cheap and you'll have to use the wall wart if your power distributor doesn't do 12-volt high current. 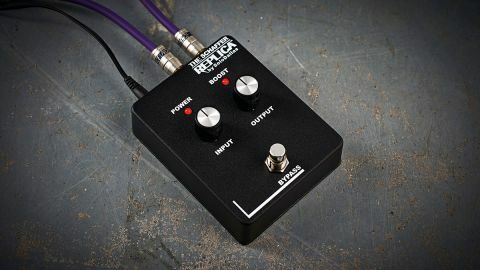 Creating a pedal to replicate the sound of a vintage piece of equipment is fairly commonplace among manufacturers these days. Creating a pedal to recreate the sound of something never designed to make a specific 'sound' in the first place, however, is a pretty arcane concept, as is designing a pedal to absolutely recreate the specific sound of one guitarist. The SoloDallas Schaffer Replica ticks both of those boxes, as it is designed to replicate the effect of using a vintage wireless system, the Schaffer-Vega Diversity System (SVDS), a piece of equipment Angus Young of AC/DC used on stage and apparently also put to use in the studio during the recording of Back In Blackand other albums. This pedal is the culmination of a 30-year long quest by Fil 'SoloDallas' Olivieri, a guitar player and AC/DC fan. Fil was so obsessed by Angus Young's tone that, over the years, he had bought a duplicate of every bit of gear he knew that Angus had used in a bid to get the same tone for himself. He couldn't, however, quite manage that and felt that a vital piece of equipment might be missing. Eventually, Fil came across an old interview with Angus with the information that he needed: that missing piece of equipment was the SVDS, which Angus had used from 1977 to 1984. The SVDS had, in fact, been used by many artists since it was first released commercially in 1977, but only about 1,000 units were manufactured until it ceased production in 1981. Fil could not find a unit, but eventually got in touch with its inventor, Ken Schaffer, who was able to supply him with one. According to Fil, once he got it up and running with his Gibson SG and Marshall Plexi, the result was "instant Angus". What was going on with the sound was a compressor and expander circuit (compander) that was designed to increase the radio system's dynamic range, but also gave a rich harmonic boost to any amp that the wireless receiver was plugged into. The rest of the story sees Fil getting Ken Schaffer's permission to produce a replica of the circuitry (without the wireless component) and employing a team of engineers to reverse-engineer an SVDS. The result is the SoloDallas Schaffer Replica, available as a pedal, or a 'Tower' unit that's housed in a cabinet nearly the same as the original SVDS to totally replicate the look and feel of the 1970s Schaffer-Vega Model 63EX receiver. At first glance, it's apparent that this pedal doesn't follow standard pedal convention: a red LED stays on all the time to show you that it is powered up, while another red Boost LED lights up when you press the footswitch. Input and output knobs - equivalent to the original wireless system's Sensitivity and Monitor knobs - work together to set the amount by which your signal is boosted. If you set it for more or less unity gain, even though there's no jump in volume, there's a sonic shift that we'd describe as an improvement in tone, and as you turn things up you'll be into the boost zone, adding sweet overdrive to your amp. Overall, your sound seems thicker and more crisply defined, a little larger than life maybe and nicely touch-sensitive: whatever compression and EQ is going on here is a good thing. With our Marshall, that Angus vibe is there, but this is a pedal that can work with any amp; we tried it on a couple of Fenders with great results and really got a vintage non-top boost AC-30 singing. Tone conditioning pedals that you leave on all the time as the special ingredient in your signal chain are a growing trend - the Klon and its klones come to mind, and there are some players that couldn't be without the Xotic EP Booster, which replicates the boost and tonal profile of an Echoplex tape echo's preamp. The Replica is a pedal of a similar ilk: try it and you won't want to turn it off. The narrative's circle is complete - the Replica has established its credibility by the mere fact that Angus Young now uses one as part of his stage rig, and he also recorded with it for the Rock Or Bustalbum.